3 Costly Mistakes Real Estate Investors Make and How to Avoid Them! Head on over to MPREIA Meetup www.meetup.com/MPREIA/events/kvnwrpyzgbgb/ to become a member! Learn best practices to run your real estate investing business and avoid the mistakes they have already made! Ron & Angelina always teach the respected E-Myth approach for running your business. The classic book “E-Myth: Why Most Businesses Don’t Work and What to Do About It” by Michael E. Gerber teaches that you should “work on your business, not in it.” So why are you always working in your business? It’s all about systems, policies, and procedures… with consistency and predictability. Why "reinvent the wheel” when it has already been done? • Systems run the business and people run the systems. • Systems permit ordinary people to achieve extraordinary results predictably. re·nas·cent, adjective becoming active or vigorous again. experiencing renewed vigor; being reborn. Angelina Harris lead a double life until she attended a Tony Robbins event and quit her J.O.B! She was a former Senior Human Resource professional by day and now a full-time real estate investor, real estate broker, property manager, business coach and mentor by night. She started her investing career in 2006 and became an expert with pre-foreclosures, short sales, and property management. She believes in creating systems, policies, and procedures for building E-myth businesses. She is Co-Founder and Managing Broker of Spearhead Realty, www.spearheadrealty.com, an investor friendly real estate brokerage that is shifting the paradigm of the standard real estate brokerage model. She is also a real estate mentor & coach with Renascent Mastermind, www.RenascentMastermind.com. Ron Harris is on a journey of a renascent entrepreneur constantly reinventing himself, redefining his business and living the “4-Hour Workweek” life. He leads a double life being asleep by day and real estate investor, coach, mentor, and motivational leader by night. He got his start in real estate investing in 2006 after a “mind blown” moment after reading Rich Dad, Poor Dad and bought his 1st rental right after. He went full-time real estate investing in 2009 and found his ultimate purpose in life in 2012 by coaching and mentoring others. His ultimate goal is to help 1,000 entrepreneurs become millionaires. He gives back to the community with OKC Entrepreneur Group, www.okceg.com, a free resource for entrepreneur’s inspiration and encouragement to take the roller coaster ride of entrepreneurship. He hosts the free Meetup “Coffee with Real Estate Investors, www.CoffeeWithRealEstateInvestors.com to create great conversations with like-minded real estate investors. He is also a real estate mentor & coach with Renascent Mastermind, www.RenascentMastermind.com. • or save $60 by purchasing an annual membership for $179. We have an "MP MIXER" from 6:00 - 6:30 pm with food provided by a sponsor every month! Come early and get your extra door prize ticket for TWO chances to win! Registration opens at 6:30 pm, event starts promptly at 7 pm. Be early so that you can visit the vendor tables and still get a great seat for the meeting. Cost: 1st Time Visitors is Free (Mention Ron or Angelina), Then $25 thereafter. Annual Membership available. The reason for the Peak Performance Strategy sessions was to encourage you to go to the Tony Robbins “Unleash the Power Within” in Dallas, July 11-14, 2019 and wanted to invite you to come with us. If you’ve never done something like this with a group of like-minded friends, then you don’t know what you’re missing. I remember as a teenager going to these types of motivational and education events with Dad and it was always incredible…every single time, even when I didn’t feel like going. I was always glad my dad dragged, err encouraged me to go! Something about, “you get to drive the car if you go” always seemed to work. I never knew there was so much wisdom in trickery! Thanks Dad! Send it back to me at info@okcentrepreneurgroup.com and I’ll get it submitted. Need it back by Monday afternoon April 8, 2019. Unleash the Power Within is a live 3 ½ day event with Tony Robbins designed to help you unlock and unleash the forces inside that can help you break through any limit and create the quality of life you desire. Learn how you can surpass your own limitations to achieve your goals and improve the quality of your life. Oh, if you want to see something funny with JP Sears Ultra Spiritual Life Episode 40 about the Tony Robbins Experience go here https://youtu.be/aPI5TexgiXA . Angelina & I were there. I got to meet Sears & wasn’t sure if he was serious or in character when I asked him what he does for a living, ha. Satire at its best! All product and company names are trademarks™ or registered® trademarks of their respective holders. Use of them does not imply any affiliation with or endorsement by them. OKC Entrepreneur Group, Renascent Mastermind, and Spearhead Realty makes no representations about the suitability of this information and services for any purpose. OKC Entrepreneur Group, Renascent Mastermind, and Spearhead Realty is not responsible for, and expressly disclaims, all liability for, damages of any kind arising out of use, reference to, or reliance on any information received at this event. Please seek legal and medical advice prior to attending. Unleash The Power Within™ and other Anthony Robbins brands and trademarks are solely owned by Robbins Research International, Inc. OKC Entrepreneur Group, Renascent Mastermind, and Spearhead Realty is not affiliated with Robbins Research International, Inc. or Anthony Robbins companies. This is for informational purposes only. OKC Entrepreneur Group, Renascent Mastermind, Spearhead Realty, agents, members, associates, sponsors, is not responsible. Oh, if you want to see something funny with JP Sears Ultra Spiritual Life Episode 40 about the Tony Robbins Experience go here https://youtu.be/aPI5TexgiXA . Angelina & I were there. I got to meet Sears and wasn’t sure if he was serious or in character when I asked him what he does for a living, ha ha. Satire at its best! FREE to ATTEND - Bring a like-minded guest. It's about the conversation! • More than 60% of salespeople miss their sales goals. • The average salesperson makes two attempts to contact prospects, while 80% of sales are made after the 5th contact. • 50% of sales go to the first salesperson to contact the prospect. • 80% of your sales come from 20% of your sales force. • Only 11% of salespeople ask for referrals. What are these habits costing you? • Learn the 3 actions you absolutely must take to be successful in any business. • Destroy the 2 obstacles that are dramatically limiting your sales. • Discover the fastest method for doubling your sales without spending a penny. • Develop an unshakeable mindset that will give you a competitive advantage in your industry. 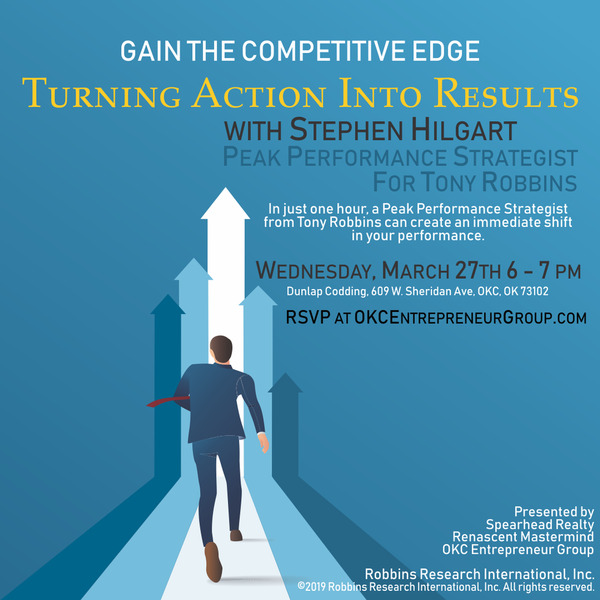 For nearly 40 years, Tony Robbins' Peak Performance Strategists have been offering personalized business strategy sessions to organizations ranging from smaller businesses to Fortune 500 companies. Our mission is to empower your team with the same tools and strategies that Tony Robbins has used to help millions of people around the world take their lives to the next level. With no obligations....at the end of this workshop is an invitation to those that have an interest in learning these business strategies directly from Tony Robbins at his live event "Unleash the Power Within" coming to Garland Texas, July 11-14, 2019 at the Curtis Culwell Center. • Ranks among the "Top 200 Business Gurus"
• One of the "Top Six Business Leaders in the World"
• Ranks as one of the "Top 50 Business Intellectuals in the World"
It's always about the conversation! "It's all about the conversation!" FREE to attend. Bring a like-minded guest! Sit around with like minded individuals meeting & networking over coffee. Have great conversations about real estate investing, success, building a successful business, and chasing the American dream. We have newbies to multimillionaire attendees. You never know who you will meet! • Other: Systems, Technology, Contracts, Contractors, Vendors, Investor Friendly Realtors & Agents, Resources, Risks, the "unknowns", the "I don't know what I don't know", and more! The power of like-minded conversations should never be underestimated! You become like those you hang out with & associate with on a consistent basis. You never know what you may learn, from one simple idea to a groundbreaking epiphany that could change your life! We are a group of like-minded individuals. Come & go as need be. Casual environment. Every 1st Wednesday of the month 7 - 9 PM. Afterward: Many of us go to dinner for more great conversations. "It's all about the conversation!" FREE to attend. Bring a like-minded guest! Join the League of Renascent Entrepreneurs today! We are going to Table Rock Lake, Branson, Missouri, for a 3 day workshop March 22-24 (Fri-Sat-Sun). Leave Monday morning. Ever wonder why you find it so hard to unlearn things, turn your dreams into reality and build a successful future full of rewards and wealth? Maybe you have been doing it all wrong. See below for quick videos on the Brain Dump Process & pictures of the location at the retreat. At this brain dump retreat, you will reach into your inner mind and heart and ask the big questions "what, how & why" on all levels of your life. The process will ask your brain the questions and you will receive your answers. Be prepared to receive unfiltered answers. What is a Brain Dump? A brain dump is a complete transfer of accessible knowledge from your brain to somewhere else such as a journal. Start by asking your brain for answers to things that elude your or how to attain specific things or goals. Wikipedia.org states that it is the transfer of a large quantity of information from one person to another or to a piece of paper, such as a journal or other medium. What may surprise you is what ends up on that paper and what doesn’t end up on that paper. The purpose of the Brain Dump Retreat is to get the answer to your goals and life plan by providing a place of solace with a specific plan of action. By asking your brain questions, then delaying the answers until a specific time and date for the purpose of discovering the answer to your questions that will have a profound impact on your life and/or partners. You will ask your brain-specific questions about anything you desire about life, love, relationships, physical, financial, spiritual, business, universal or anything imaginable. You will tell your brain to not give you the answer till the specific time when you do your brain dump. If possible and prior to the brain dump, document your questions not just in your mind but also on paper so that you can continue to review and ask the same question; and telling your brain not to give the answer till it is time. Your brain works on the solution continually, even when you are asleep. Combine the Brain Dump with asking the right questions, your potential life plan becomes powerful and unstoppable. Plus, we spend most of the time relaxing & hanging out with like-minded individuals. It's all about the conversation! Prepping for the Brain Dump process: The delayed process of asking your brain the questions for the most important answer. More to come on Agenda. Join us if you want, it would be a great time to do your "Brain Dump" and set your goals as well! The cost of the Retreat is $500 per person with discounts available for coaching students, agents and previous attendees. Breakfast, Lunch, and Dinner provided. • $1000 Per Couple (king bed) & $400 per Single. • Discount: $800 per Couple & $350 per Single. For past attendees, Renascent Mastermind students & Spearhead agents. • BONUS: Past attendees get a bonus extra day before the event (Thursday). Extra networking, hanging out & more. Includes: Room, Brain Dump Retreat & Workshop, Food & lots of fun! That cheap for a 3-day retreat! WOW! Recap: Includes the Brain Dump Retreat & Workshop, Room, Food & lots of fun! That is inexpensive for a 3-day retreat! WOW! Check in Friday, March 22nd at 3 pm and checkout Monday, March 25th, 2019 at 10 am. See below for quick videos on the Brain Dump Process & pictures of the location of the retreat. Please let me know ASAP if you would like to join us. I have already booked the luxury home and have additional homes if needed. Also, we need to send you a document to start preparing your brain ahead of time. The sooner the process is started the better. Email us at info@renascentmastermind.com or call 1-800-565-9786. Education, Coaching, Mentoring, Mastermind & Lifestyle Design on Real Estate Investing & Entrepreneurship. Take the next steps to a life you deserve. It's all about the conversation with like-minded renascent entrepreneurs. Achieve freedom by learning about real estate investing & entrepreneurship. Real estate is one of the most rewarding endeavors & the path to financial freedom. Contact us soon before you miss out on the next real estate housing bubble. Get the life you deserve by changing your mindset and implement success principles. Attend our brain dump retreats, mastermind sessions, individual coaching, group coaching, advanced coaching and more. Mastermind & accountability in a peer group. Together we all achieve more! Master the systems to go big. This mentoring isn't for the faint of heart. One-on-One Coaching with a mentor who knows the battlefield you are about to face. Avoid the landmines to success. Want to go hang out with a bunch of Real Estate Investors & Entrepreneurs while playing board games? We will meet up, hang out, band together and try to conquer other board gamers! The conversations about business, entrepreneurship, real estate investing and more happens over a cardboard battlefield while we are stuck, in person, across from each other. It's actually a great experience as we build like-minded relationships. You never know who you will meet that changes your life, new friend, and future business relationship. Let's have fun! DON'T WAIT to order your ticket or you'll have to be on the "Wait List." You will need a BGG account to register. BGG will send you confirmation and hotel information. 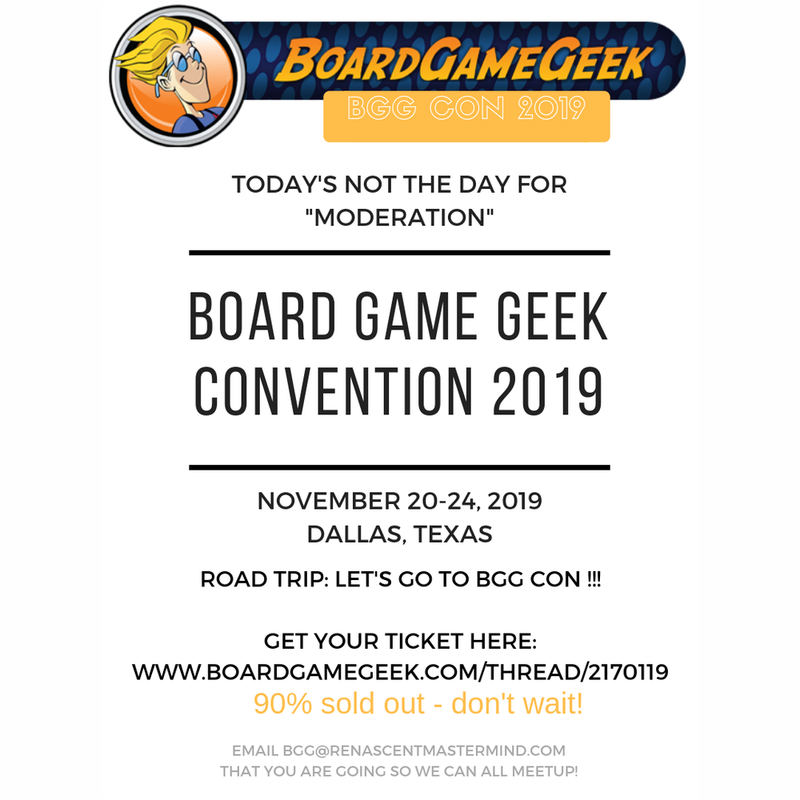 After you register & purchase your ticket from BGG, send email to bgg@renascentmastermind.com so we can exchange contact information, coordinate our schedules, and meetup! Don't forget to send me your mobile number (texting will be our friend). What to Bring: Games, clothes, soap, MUST bathe daily, generous amounts of hand sanitizer & a mindset of "winning"! We are just meeting up together on this road trip to BGG.CON. This is for informational purposes only. Renascent Mastermind, OKC Real Estate Investor and other is not responsible. We are not affiliated with Geekdo, Board Game Geek, BoardGameGeek, LLC (BGG), it's agents & affiliates. All product and company names are trademarks™ or registered® trademarks of their respective holders. Use of them does not imply any affiliation with or endorsement by them. (ALL) Renascent Mastermind, OKC Real Estate Investors, OKC Entrepreneur Group, Oklahoma Real Estate Agent Network, affiliates, agents and representatives makes no representations about the suitability of this information and services for any purpose. ALL is not responsible for, and expressly disclaims, all liability for, damages of any kind arising out of use, reference to, or reliance on any information received at this event. Please seek legal and medical advice prior to attending. Geekdo, BoardGameGeek, the Geekdo logo, and the BoardGameGeek logo are trademarks of BoardGameGeek, LLC. BGG and other brands and trademarks are solely owned by BoardGameGeek, LLC. Intro Video from Ron: https://youtu.be/FPI5qGYt-jY Bloopers Included! Ed Zinnamon will be interviewing Ron & Angelina about real estate investing and taking Q&A from the audience. • Want to get out of the rat race? Want to fire your boss? Want financial freedom with time to spare? • Learn how to build your home team advantage and get one or both spouses to leave their J.O.B. and go full-time real estate investing. • How to run a full-time real estate investing business flipping and renting houses. • How to time-block the “work-life balance” myth with family. • How to work with Realtors an Agents to find deals and lease your properties. • How to STOP lifting a hammer! becoming active or vigorous again. experiencing renewed vigor; being reborn. Ron Harris is on a journey of a renascent entrepreneur constantly reinventing himself, redefining his business and living the “4-Hour Workweek” life. He leads a double life being asleep by day and real estate investor, coach, mentor, and motivational leader by night. He got his start in real estate investing in 2006 after a “mind blown” moment after reading Rich Dad, Poor Dad and bought his 1st rental right after. He went full-time real estate investing in 2009 and found his ultimate purpose in life in 2012 by coaching and mentoring others. His ultimate goal is to help 1,000 entrepreneurs become millionaires. He gives back to the community with OKC Entrepreneur Group, www.okceg.com , a free resource for entrepreneur’s inspiration and encouragement to take the roller coaster ride of entrepreneurship. 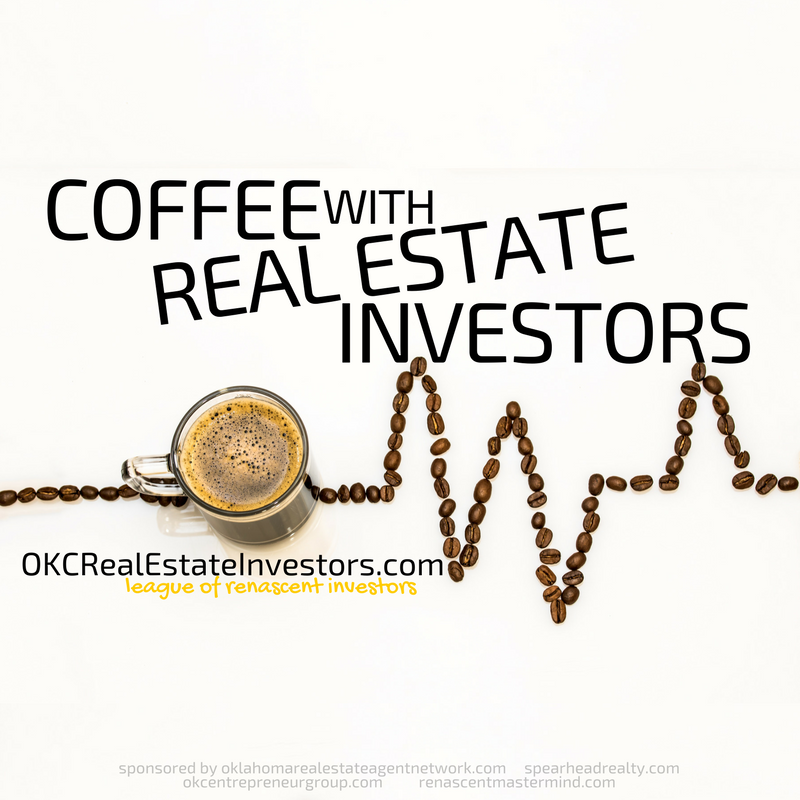 He hosts the free Meetup “Coffee with Real Estate Investors, www.CoffeeWithRealEstateInvestors.com to create great conversations with like-minded real estate investors. He is also a real estate mentor & coach with Renascent Mastermind, www.RenascentMastermind.com . More Info about Ron & Angelina Real Estate Investing Coaching & Mentoring Program. Individual, Group & Workshop programs available. Learn more at www.RenascentMastermind.com . Mind blowing brain hack retreat! Life planning the way you deserve! This is a lifestyle mastermind retreat for goal, financial and life planning. Brain Dump Retreat for Renascent Mastermind. This is a lifestyle mastermind retreat for goal, financial and life planning. Call or email us for next event if not already listed. Going for your dreams, confidence, exploring, happiness, fulfillment, embracing unknown, excitement, liking change, living without limits, abundance, face fear & getting most out of life. Fear-Setting, Dodging Bullets & Escaping Paralysis. The 4-Hour Work Week method by Tim Ferriss. "Conquering Fear = Defining Fear"
Missing having great conversations after watching movies!